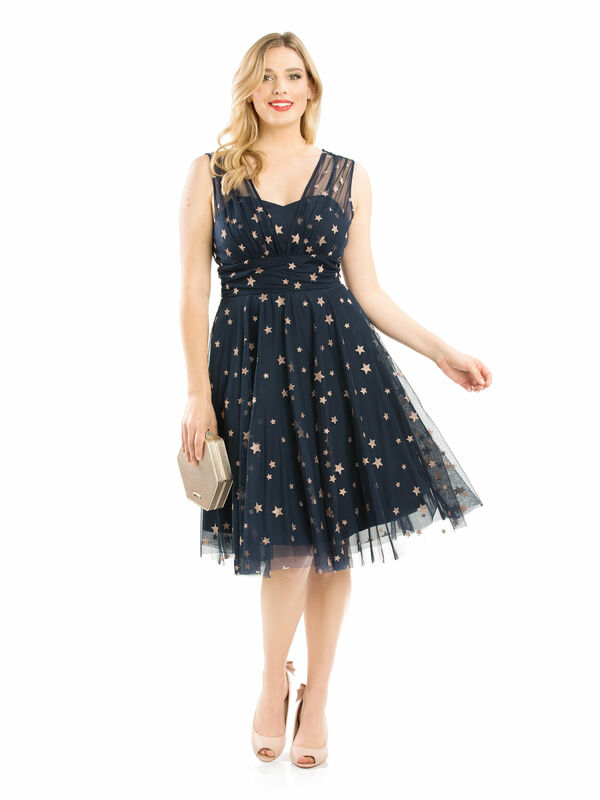 Wish Upon A Star Dress https://www.review-australia.com/au/wish-upon-a-star-dress-navy/RE19DR226.RENVY036.html Be the shining star of the night in our divine Wish Upon A Star Dress. Featuring luxuriously soft mesh tulle with a rose gold star print, strapless bodice and overlaying mesh straps. There's also a full skirt that's made for dancing! Wish Upon A Star Dress is rated 4.8 out of 5 by 53. Rated 2 out of 5 by Katierenee from Ill fitting and overpriced I purchased this dress in a 12 and it is just so I'll fitted! The mesh sleeves are really big and slip off my shoulders, the underarms gape but the waist fits perfectly? I'm usually a consistent 12 in review so am a bit confused as to why this dress fits so wierd. It also seems to be quite expensive for what it it. It is pretty but not worth the price in my opinion. I will be returning it unfortunately. Rated 5 out of 5 by Mell1e from I Feel Like A Princess This is one of my all time favourite Review purchases. I fell in love the moment I saw it and had to purchase even with no event planned. I am now in the process of creating and finding special events to go to just so I can wear the dress again. It is a beautiful fit (though I went down a size for it) with a stunning pattern. A truely special, magical dress that makes me feel like a princess. Rated 5 out of 5 by Dayle from Festive with a twist I bought this to wear to my work Christmas party and I’m so glad I did. I’m a 14 in Review and 180cm tall, and it fit very well. I was worried the shoulders might fall down as I often have that problem, but they were fine. The fit and length of the skirt was just perfect. All in all a great party dress that’s ideal for Christmas but will still work any other time. Rated 3 out of 5 by laurenanita from Voluminous and soft a pretty dress but not suitable for my short frame. The material is lovely and soft but the shape of the neckline and the long length of the skirt didn’t suit me. 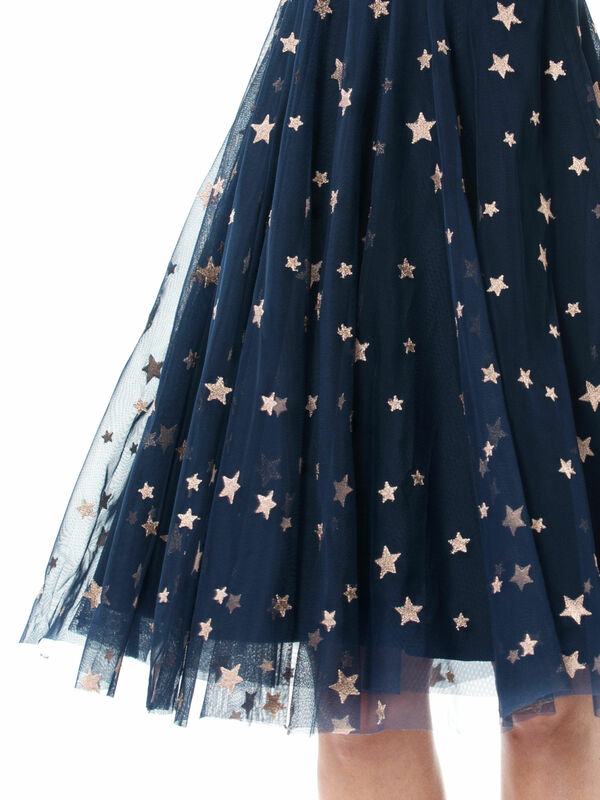 Lovely midnight blue fine tulle overlay with stars. I imagine this would look amazing on someone over 5 foot tall with some decent heels on. Beautiful dress but not for me, that’s all. Rated 5 out of 5 by Caroline77 from Perfect for Christmas I bought this dress to MC our community Carols and it was perfect! I had so many comments. It fitted perfectly and is beautifully made. Although the stars are described as rose gold I wore pale gold sparkle shoes and they matched well. I am usually a size 8 but am wearing a size 6 as the bust was too large for me in the 8. Rated 5 out of 5 by Fern from Gorgeous, elegant - but consider sizing down Just exchanged the size 10 I bought online for an 8 in store (thank you Chadstone!) - I’m a 10-12 in other brands (and I wear a 12 in Chessies) so consider sizing down, especially as (last time I checked) there were only small sizes still left. This dress has almost sold out because it’s fabulous - snap one up if you can! Rated 5 out of 5 by BLiz from Stunning Dress I bought this a few weeks ago, I have not worn it yet because I'm saving it for my work Christmas party. It is so flattering and comfortable on but the bodice and straps of the dress i found to be quite large and i had to size down. I'm a 12 in 90% of review and i took a 10 in this dress.